Hello all and thanks for stopping by today! 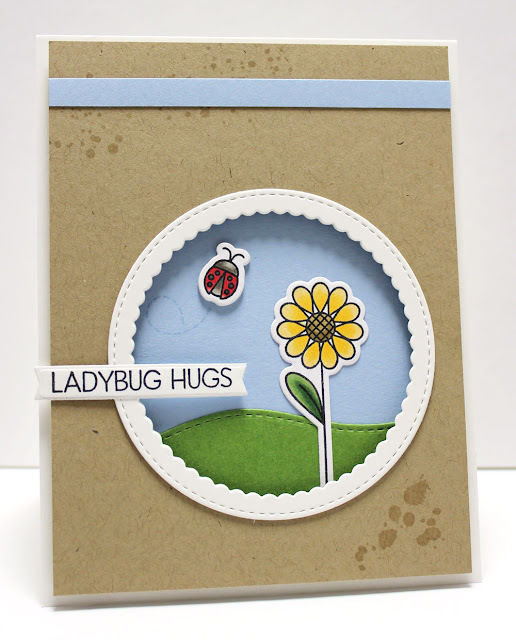 I have a card to share with you for this month's MFT DT Creative Construction with Blueprints Challenge. We are whipping out our blueprints that contain strips, tags, and flags. I grabbed one of the more recent Blueprints, 27 for the teeny flag that comes with it. It is the perfect width for smaller sentiments. I used the cut and recut method to shorten the flag a LOT. I created a scene using the Fly-By Friends stamp set and Die-namics, and framed with the Stitched Scallop Circle Frame (I LOVE those things).